Ember and I sat out by the pond one evening this week. The grass was warm and soft, and chicken poop free. After a time of quiet solitude, enjoying the beautiful sunset, I remarked to her how each sunset is so different. She looked at me quizzically and asked, "What's a sunset?" It was my turn to look at her with dismay. "Really?" I asked. "Never mind," she replied with a sigh. 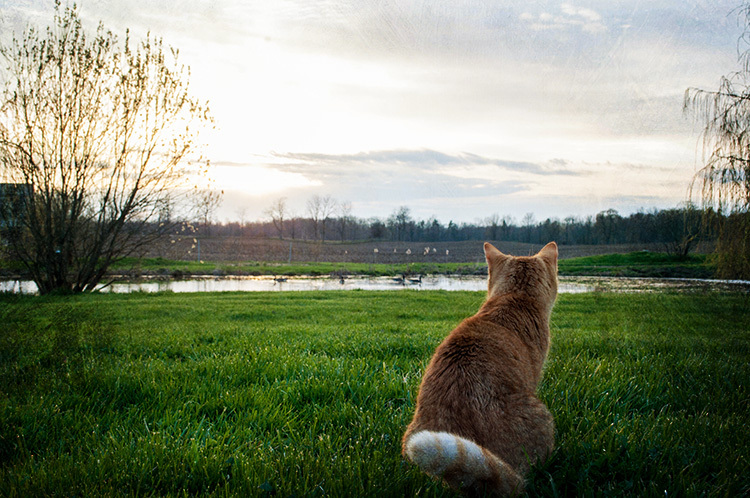 "What I really want to know is are those geese staying and can I have one for my very, very own? I'd like to call him George." And then Ember became an indoor cat. Great shot, it's finally greened up here! Ember looks like my Oliver! Oliver would have no idea what to do with a goose! You give me smiles many . . . Uh oh! I better clue Mr. Mouse on my blog that Ember is shopping for friends! Funny, Ember is a cutie! Happy weekend! And then I cracked up laughing Andrea!!! Yep. That would do it for me, too. Ember would become an indoor cat. Thanks so much for joining in this week - it's very nice to meet you. What a lovely picture and you really made me laugh with the story! Super photo, love hearing about Ember's thoughts. Beautiful photo! Thanks so much for linking up at the Creative HomeAcre Hop. Hope to see you again this Sunday! Thanks so much for sharing this cute conversation with your kitty on The Creative HomeAcre Hop! I'm featuring it today! Came here by way of Claudia from Mockingbird Hill Cottage. Love your Ember post ... very much needed after the passing of our Kitty Kramer a few days ago. My heart continues to break but found comfort in your lovely words and image. Thanks!